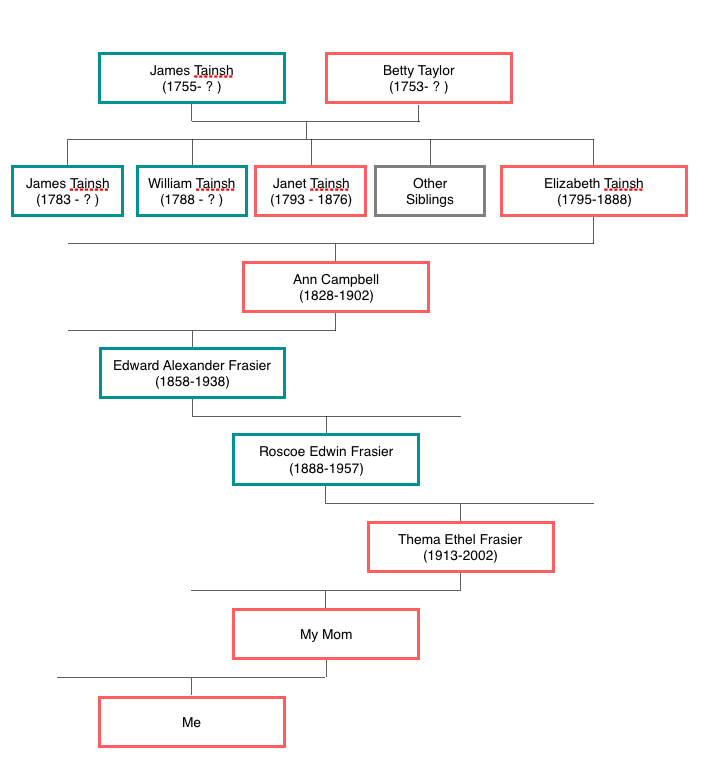 In this series of posts, I will share what I learned about the Tainsh family in Crieff. In this first part, we’ll look at the village of Crieff and where they likely lived. James and Betty are my 5x-great-grandparents! 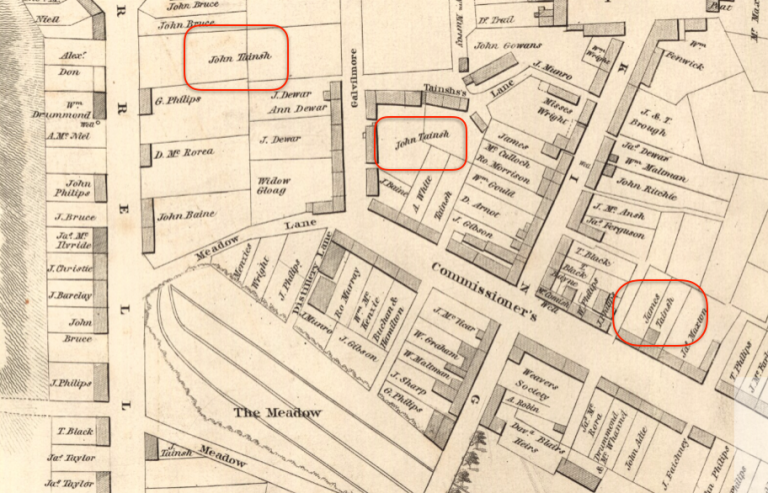 They had at least 10 children, but in this series of posts I will be discussing four of them: sons James and William (who checked out books from the library); Janet (who is known to have stayed in Crieff throughout her life); and Elizabeth (my 4x-great-grandmother). What do we know about Crieff? (By the way, it is pronounced such that it rhymes with “grief”.) It is an ancient and strategically located town, on the border between Highlands and Lowlands people. It got caught up in a lot of the insurgent vs. loyalist battles of the 1700’s, and was actually burned down by the Highlanders in 1715. It is located on the slope of a rather steep hill, probably an advantage to provide swiftly flowing water for power generation and and other industrial activities. During James and Betty’s time, the population was around 3,500 people and the principal industry was cotton weaving. Many inhabitants had looms in their homes. We know that James was a stone-mason, and one of his daughters, Janet, was in the cotton weaving business with her husband. Amazingly, I was able to find a map from 1822 that shows exactly where James and his family lived (the far-right red oval). There was a John Tainsh that had property in town, also (the other red boxes). John may have been a brother to James but I’m not certain. James’ family lived near the corner of King Street and Commissioner’s Street. Those streets still exist today, and in fact, we drove by the location where the James Tainsh family lived! 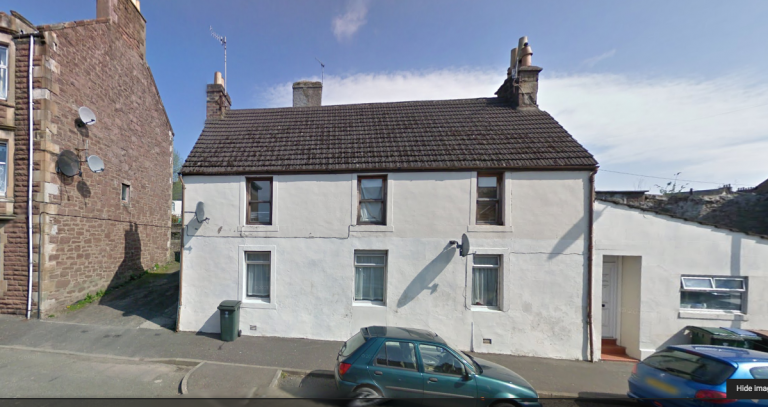 Here’s what it looks like on Google Streetview – I don’t know if this is the original building but it looks pretty old! Next time, we’ll investigate the books that the Tainsh boys checked out from the library.